I usually go to San Francisco when I want a nice dinner out or to try some delicious innovative food. But when I’m in the mood for something casual, the East Bay has plenty of neighborhood joints that have been popular for years. 1. Fentons Creamery: Everyone in the East Bay has heard of Fentons Creamery, a historic ice cream parlor serving favorite American flavors located on Piedmont Avenue in Oakland. Their original location first opened in 1894 and moved to the current location in 1961. Fentons Creamery is known for their enormous ice cream sundaes but they also serve salads, sandwiches, burgers, and other American classics. Western Bacon Burger with BBQ Sauce, Cheddar Cheese, and Onion Rings. Cookies and Cream Petite Sundae with Caramel and Whipped Cream. Now I ordered the petite sundae and it was still a decent amount of ice cream for me. They offer numerous sizes for sundaes and some are just ridiculously ginormous! 2. Zachary’s Chicago Pizza: Zachary’s Chicago Pizza, located on College Avenue in Oakland, has been around since 1983 and it’s still one of the most popular pizza joints in town! Now they have multiple locations but I’ve only been to their original since it’s right near my house. Their speciality is of course deep dish pizza, not your typical Italian style pizza that’s for sure; I’m not sure if I can even call it a pizza because it’s more like a pizza pie. Now they even serve thin crust pizzas for those who don’t want the deep dish option. Half Chorizo and Green Chili and Half Veggie Deep Dish Pizza. Half Pesto and Half Veggie Deep Dish Pizza. I usually get their chorizo deep dish style pizza but recently I tried the thin crust style pizza and it was delicious as well! For the thin crust pizza, I would recommend the white pizza with garlic, Ricotta cheese, Mozzarella cheese, fresh herbs, and lemon if you want something on the lighter side or the carne if you want something more meaty and substantial. 3. Homeroom: Homeroom is a fairly new spot in Oakland off of Broadway but it’s always packed. Their specialty is mac and cheese, every kind of way you can imagine! If you’re not in the mood for mac and cheese, they also serve salads and sandwiches. I tried the Gilroy garlic mac and cheese and the smoky bacon mac and cheese. Smoky Bacon Mac and Cheese. Gilroy Garlic Mac and Cheese. 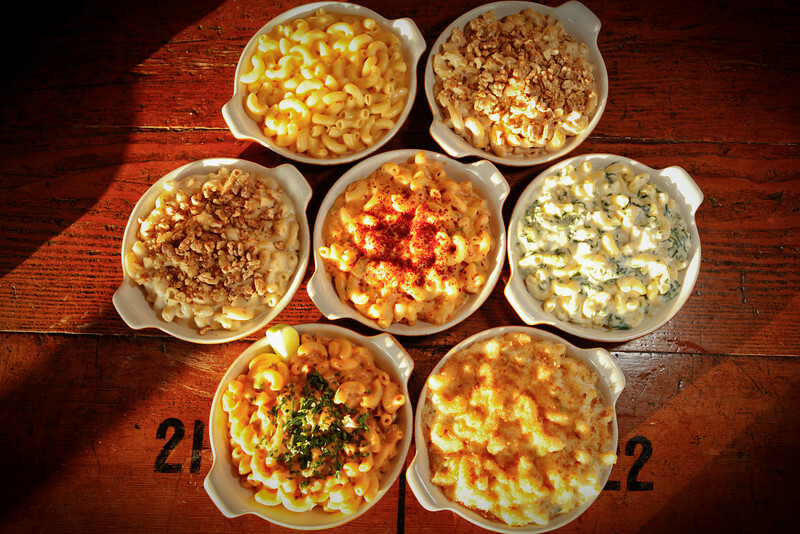 Here are some of their other mac and cheese options. 4. Gordo Taqueria: One of my absolute favorite Mexican joints is Gordo Taqueria on College Avenue in Berkeley thanks to my friend Matt who took me there back in high school. They have numerous locations in Berkeley but also in San Francisco; however, I’ve only been to the College Avenue location. If you go here you must and I mean must get the quesadilla even if you’re craving a burrito. Usually quesadillas are just two tortillas with melted cheese in the middle but theirs is basically a burrito with melted cheese inside wrapped in a crispy fried tortilla. So freakin’ good. The Photo Doesn’t Do it Justice! Rice and Bean Quesadilla and Chips and Guacamole. Carnitas Taco and Rice and Bean Taco. 5. Ici Ice Cream: If you’re craving ice cream but don’t want the typical American flavors such as cookie dough, rocky road, cookies n’ cream, or mint chocolate chip, then head over to Ici Ice Cream on College Avenue in Berkeley to try some unusual flavors. They change their ice cream flavors regularly and they also sell ice cream cakes, ice cream sandwiches, and ice cream bon bons. Orange Brandied Currant and S’mores Ice Cream. Toasted Coconut Rum and S’mores Ice Cream. 6. Donut Savant: I just heard about Donut Savant in downtown Oakland recently where they sell mini donuts and cronuts (hybrid of a donut and a croissant). I was excited to go here because one, I had never tried a cronut yet and two, they sell mini donuts so I could try multiple items. My favorite items were both the vanilla and maple glazed cronuts, apple fritter, coconut dream mini donut, and maple pecan mini donut. So yummy. Cronuts and Mini Donuts! Yum! What’s your favorite neighborhood spot in the East Bay? Also be sure to read my previous post on some of my favorite sandwich shops in Oakland here!